Give your entire office professional-level color. Now there's a network-ready printer that's robust enough to handle short-run professional-quality print jobs, yet easy enough to fit right into your busy office. Inspired color control features and printer management tools simplify printing and give you the power to do more than ever before. Save big when you bring your workgroup's diverse and high-volume color printing in house. The Phaser 7500 sports plenty of features that make it a perfect fit for the office on-demand print environment. Fast 35 ppm color printing. That means 100 copies of your 20-page color report will print during your lunch hour. The high-speed 1 GHz processor ensures that both long print runs and complex jobs with graphics, photos or charts process rapidly. Networked to share. Gigabit Ethernet is standard, and everyone, regardless of environment - Microsoft Windows, Apple Macintosh and Linux - can tap into the power of the Phaser 7500. Increase accountability and reduce costs. Use accounting features to track and analyze both color and black-only printing, and to accurately charge back billing for individuals or departments. Convenient and resourceful. Sized to fit your workgroup's space and printing needs, it's available as a low-profile desktop printer, or it can be configured into a highly productive floor-standing model with three additional 500-sheet trays that can load paper sizes up to 13 x 18 in. Bring more types of jobs in house. Produce professional-looking brochures, newsletters and reports with features such as automatic two-sided printing, booklet printing and collation. Print on an array of media, including labels and card stock, and sizes up to 47 in. banners. Produce brilliant, accurate color right "out of the box." The Phaser 7500 printer delivers the tools to make you look like a color expert. 1200 x 1200 dpi resolution for sharp, detailed prints. So precise, the color you're matching does exactly what you expect - it matches. The secret? It uses the tools of the pros: True Adobe PostScript 3 ensures that visually rich documents print reliably and fast, while Pantone approved color tables make sure that specified colors print accurately and consistently. Xerox EA toner produces the smallest toner particles in the market - for finer lines, higher contrast and sharper quality. EA toner also requires less energy to manufacture and reduces the amount of toner needed for printing each page. A powerful color technology works behind the scenes to automatically give you the best color for each element on the page. Use it to select automatic presets to match a specific target, like a press or your computer screen. Or get creative and use it to fine-tune color and get special effects without changing your file. Expert-level tools are built in, including the Black Trapping feature, which keeps text sharp and readable whether printed in black on colored backgrounds or in color on black backgrounds. Running complex jobs doesn't have to be complicated. The Phaser 7500 offers superior printer management capabilities and innovative features that make it especially easy to use. Effortless printer management with CentreWare Internet Services embedded web server. Save time with configuration cloning and automatic installation. View job status and troubleshoot right from your web browser. The easy-open access is right up front; no need to rotate or move the printer to perform routine maintenance like changing toner and adding paper. Bi-directional communication provides updates on your print jobs, along with toner supply levels, from the front panel, your desktop or even over the web. Pop-up alerts immediately notify you of any print problems - and how to fix them. Store frequently printed files on the builtin hard drive (standard on 7500DX) for fast, easy, walk-up reprinting. The Print With feature lets you include a stored file with your new print job. Peace of mind. A full one-year on-site warranty and Xerox Total Satisfaction Guarantee ensure that your printer will be on-line, all the time. Media Types Supported Plain paper, envelopes, transparencies, labels, card/cover, glossy. Size (H x W x D) 15.7" x 25.2" x 26.2"
Product Warranty One-year On-site Warranty, online web technical support and telephone support. Innovative service offerings include optional extended Service Agreements. 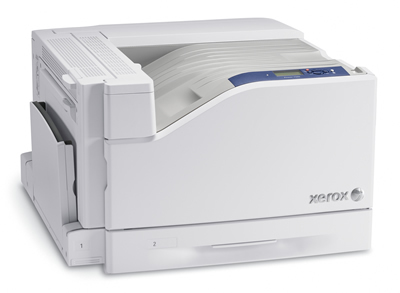 The Phaser 7500 printer is backed by the Xerox Total Satisfaction Guarantee. What's in the Box Xerox Phaser 7500 printer, power cord, standard capacity CMY toner cartridges (9600), high capacity black toner cartridge (19800), imaging unit, software and documentation CD (with User Manual, Quick Installation Guide, Warranty Statement), automatic 2-sided printing unit.